Mum of Five Staying Sane: VANS "OFF THE WALL" ICONIC FORCES MERGE IN THE 2014 STARS WARS X COLLECTION **NOW AVAILABLE**. 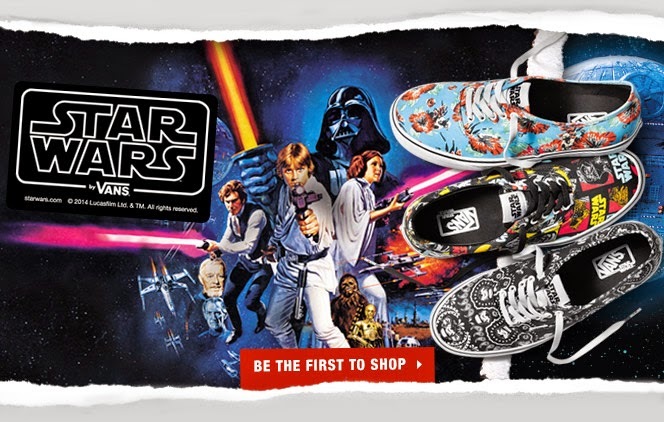 VANS "OFF THE WALL" ICONIC FORCES MERGE IN THE 2014 STARS WARS X COLLECTION **NOW AVAILABLE**. Iconic forces merge in the Vans x STAR WARS collection when scenes and characters from the legendary film meet up with the Vans Era. Featuring a custom graphic printed upper of the films characters and original logo, metal eyelets, padded tongue and lining, and Vans signature waffle outsole, the Star Wars Collection Era takes this classic to a galaxy far, far away! All styles featured plus more available on the Vans website now. Being a slightly obsessed shoe fanatic I try and keep up to date with what's going on. That is in the world of kids shoes! As in a previous blog post I think I may have stated that Mummy is now on the bottom of the new shoes list and the 2 younger boys take priority because all of the shoes I find are so darn cute and funky they just 'need' them! So I received an email from Vans two days ago informing me that the new Vans x Star Wars collection was now available to buy online. I got slightly over excited on my sons behalf! He is Star Wars obsessed. So I followed the link to view the collection and all I can say is Wow! From the Classic slip ons in the Darth Vader style to the toddler/kids Era style with the classic repeat design I didn't know which were the best. There is also a style for the girls called Yoda Aloha which are pretty cute too. The Darth Vader slip ons have Darth Vaders face on the front with red/green pattern detailing to the sides of the shoe and on the heel area it reads 'Come to the dark side'. The Era lace ups have a Star Wars logo and characters printed across the shoe in an eye catching yellow/red/black colouring. Featuring Darth Vader, Clone Troopers and Boba Fett in amongst the Star Wars wording, it also has Star Wars on the tab on the tongue of the shoe. The girls ones are extremely cute in a gorgeous light blue background colour with red floral design all over they are a lovely summery design, called Yoda Aloha. Also available in the childrens collection is a design called Stormtrooper Bandana and Boba Fett camo. The clonetrooper bandana and Boba Fett camo designs. There are also matching caps, t-shirts and backpacks. Some of the t-shirts and backpack styles that are available as part of the collection. I also found on Office Shoes that there is a classic slip on in a Storm Trooper style for children and a classic slip on in 'A New Hope' design for adults. Styles start in the Toddler size of 3.5 to 9.5, Kids size 10 to 3 and youth 2.5 through to an adult size 12 in some designs. Sizes may vary in availability between the different styles. This collection is fab, made even better by having Star Wars fans in the house anyway so there was plenty of excitement over these shoes. The shoes and the colours/images used are vibrant and well designed. We of course ordered the Darth Vader slip ons and the Era lace ups in the classic repeat design. We are awaiting their arrival but I know for sure we won't be disappointed. All pictures courtesy of the Vans website.